REDWOOD CITY, Calif. – April 9, 2013 – Mobile social gaming leader Storm8 today announced that tile-matching game Fruit Mania is ripe for release. 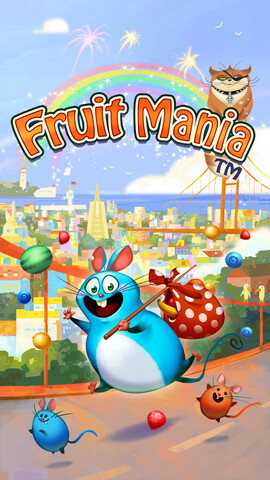 Fruit Mania is the latest game from TeamLava, the Storm8 brand behind hit apps Bubble Mania and Jewel Mania. Following the exotic travels of protagonist Harrison the mouse, the game debuts two new modes for this arcade puzzle genre on mobile. Color Mode lets players focus on matching a particular type of fruit, while Digging Mode challenges players to navigate through the puzzle and unlock hidden charms. Available today for iPhone, iPad and iPod touch, Fruit Mania serves up hundreds of levels where players burst fruit clusters with a touch. Unlike common tile-matching games that pit players against the clock, Fruit Mania delivers specially designed puzzles that require strategic matching to solve. Each level also contains new obstacles to consistently challenge players. As a leader in leveraging social mechanics in mobile game design, Storm8 has developed Fruit Mania with social connectivity in mind by allowing players to compete against friends for top fruit-exploding scores. Today’s launch comes on the heels of Storm8’s largest presence yet at the Game Developers Conference (GDC) in San Francisco, where CEO Perry Tam revealed deeper insight into Storm8’s strategic growth. Storm8 is sweetening its multi-genre portfolio and leveraging its more than 10 million daily active users with today’s colorful tile-matching game release. To join Harrison in his fruit-bashing travels around the world, download Fruit Mania today for FREE on the App Store at https://itunes.apple.com/us/app/fruit-blast-mania/id596989627?ls=1&mt=8. 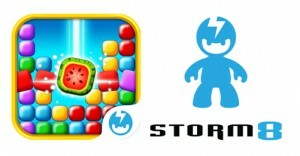 Founded in 2009, Storm8, Inc. is the leading mobile gaming network and developer of social games for iOS and Android. With more than 10 million daily active users and 400 million total downloads to date, Storm8 is also home to three innovative brands TeamLava, Shark Party and FireMocha. Under these brands, Storm8 has amassed a network of 200 million devices worldwide and continues to create engaging mobile social games that span genres – from casual arcade hits Bubble Mania and Jewel Mania, to social casual games like Pet Shop Story, Restaurant Story, Bakery Story and Dragon Story, to MMORPGs like World War, iMobsters and Vampires Live, and social casino games like Slots and Bingo. Storm8 is headquartered in Redwood City, California. For more information, please visit www.storm8.com. Storm8, TeamLava, Shark Party, FireMocha and the Storm8 network games are trademarks of Storm8 and/or its affiliates. Other names may be trademarks of their respective owners. Download assets for Fruit Mania here.